Kyoto embodies the picture perfect city. It is where one goes in Japan to experience true Japanese tradition. One can get lost in the many shrines that this city has, but they are only a small part of what there is on offer. This city is home to Gion, a district that is specifically known for Geisha, and Arashiyama which is home to one of the most beautiful bamboo forests. While a 3-day trip here is good for a start, this city will beckon one to return again, and again, and again. 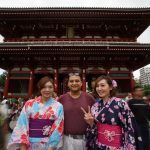 I’ve covered the ground work for visiting Japan in a separate post. This holds true for Kyoto as a destination too. I recommend going through that. Even though Kyoto used to be Japan’s capital at one time, it is not connected via an airport. The easiest way to get here is via Japan’s super-fast Shinkansen bullet trains. These trains leave regularly from Tokyo and from Osaka stations, every 10 minutes or so. The trip from Tokyo to Kyoto takes about two and a half hours and will take you past Mount Fuji. Seat yourself on the right hand side of the train on a window seat when leaving Tokyo to get a front row view of Mount Fuji. The Google Map above shows the locations of several places that I recommend visiting when in Kyoto. Like most places in Japan, be prepared to do a lot of walking. While Kyoto isn’t as big as Tokyo, it has a lot to offer, and is best seen on foot. They have an efficient train and bus service, and taxis are reasonable. 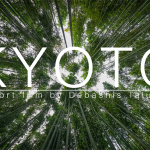 Beyond this, the aesthetic beauty of Kyoto makes it a destination that one really needs to take their time while walking through it. During my two visits there, I averaged between 20,000 to 30,000 steps. Without a doubt, the best time to visit Japan is during Cherry Blossom season. This varies every year, but is typically in spring, and can last a short as a few days and go on for up to a couple of weeks. Walking through Kyoto at this time of year is like walking through snow in the warm sunlight. It is truly something that one should experience in their lives to truly appreciate. This is peak tourist season. I recommend booking 6 months ahead to find a hotel that will offer decent prices. If spring doesn’t work out for you, you might consider autumn when the leaves turn. During both my trips to Kyoto, I stayed at the Kyoto Royal Hotel & Spa. It’s central, and has easy access to most of Kyoto’s attractions in central Kyoto. They are also close to a railway station, making it easy to get to Arashiyama. Their rooms are reasonably large by Japanese standards, and they have an awesome breakfast buffet. The itinerary below assumes that you arrive in the middle of the afternoon and are planning to stay for three nights and three days. It also assumes that you’re going to be using a combination of public transport and taxi. If you leave Tokyo at 11:00am, you’ll arrive in Kyoto around 2pm. 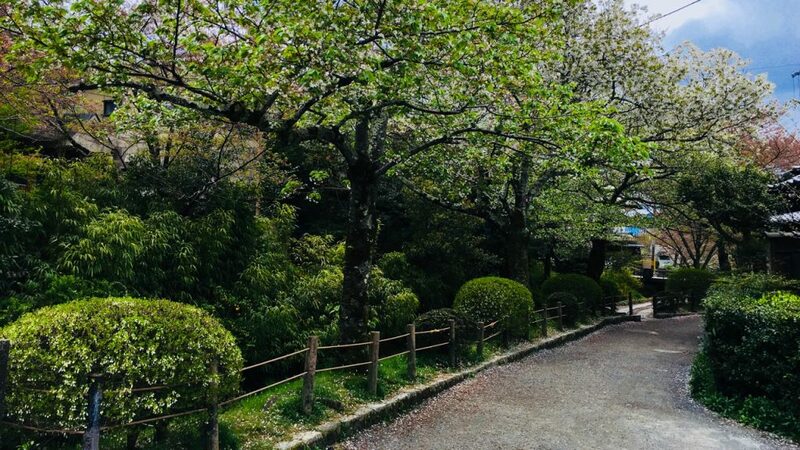 Once you’ve checked into your hotel, catch a train, bus or cab to Arashiyama. A train ride is quickest. From Kyoto city (Kyotoshiyakusho-Mae Station) take the red Tozai line to Nijo Station, and change onto the purple San-In (JR) Line which will get you to Saga-Arashiyama Station. The trip will take about 25 minutes. Your first stop ought to be the Togetsukyo Bridge. Literally the “Moon Crossing Bridge”, this is perhaps the most iconic landmark of the area. This wooden bridge was originally built in the Heian period between the 8th and 12th centuries. It is believed to have first been bult in836AD when the priest Dosho was conducting construction and repair work along the Oi River. It was again reconstructed in the 1930s. The name Togetsu means “Crossing Moon” and is said to have been given by the Retired Emperor Kameyama as he observed the moon crossing the sky from east to west. After sunset, the bridge is lit up and is quite amazing to view. While one can cross the bridge, I didn’t find much to see on the other side, and will recommend saving the time and staying close to town. From here, I recommend walking to the Tenryuji Temple. This is one of the many shrines that Kyoto is so famous for. You could easily spend a few hours here walking through the halls and taking in the gardens. I would recommend an hour here, before exiting through to the Arashiyama Bamboo forest. The bamboo forest is sizeable and comes into its own on a cool, windy and somewhat overcast day. While walking through it on a bright sunny day may offer you some respite, its the moodiness of the swaying grass and the rattling of the bamboo that make the forest come to life. The paved trail within is somewhat undulating, but is mostly flat and easy to walk. I recommend staying here till sunset before walking back to Arashiyama Train Station and catching a train back to central Kyoto. If you cannot be bothered walking after a long day, you could avail yourself of a local tour where a Japanese man will tow two if you in a hand-pulled rickshaw through the forests and around Arashiyama. Kyoto is known for its shrines, and the popular ones do get busy.The key is to start early. Start your day at the Gingaku-ji Shrine. The easiest way to get here is to catch a cab. This shrine is sometimes referred to as the Higashiyama Jisho-ji, but generally, the locals know it as the Gingaku-ji shrine. Be careful while pronouncing it and enunciate your the “G” prominently… otherwise, you may end up at another (also very beautiful) shrine. Being a very popular tourist destination, this becomes too busy to enjoy between the hours of 10:00am and 4:00pm. There is a small entry fee of JPY500 for this shrine. The centrepiece of this shrine is the Silver Pavilion. However, it has a very beautiful Japanese garden. A visit here should last about 45 minutes. Once done, exit the temple and begin walking the Philosopher’s Path. This is a tree covered path that runs along a canal. It is best done when the cherry blossoms are at their peak, when it can feel like it is snowing on a warm spring day. The path takes you through a quiet part of Kyoto, and a trail leading to the many shrines of Kyoto. Among them are the Nanzen-ji Temple and the Zenrinji Shrine. The Zenrinji (Eikando) Shrine will be your first stop. It is a large, timber shrine that has grand halls within. Once again, there is a small entry fee, which is totally worth it. The next stop on this path is the Nanzenji Shrine. At this stage, shrines can start blending into one another. What I found as the most interesting part of this shrine was the traditional garden – the Tenju-an Gardens – inside the grounds of this temple. What particularly appealed to me was the water feature pictured above with stepping stones to cross. There’s something about Japanese Gardens that give one a sense of inner peace and zen. This is one of those gardens. While a visit here should take no more than 30 minutes, I felt that I could spend hours just sitting here and watching the world go by. Entry to the garden is free of charge. At this stage, it would be lunch time. Catch a bite to eat at one of the restaurants by the National Museum of Modern Art before restarting your day of touring Kyoto’s shrines at Okazaki Park. 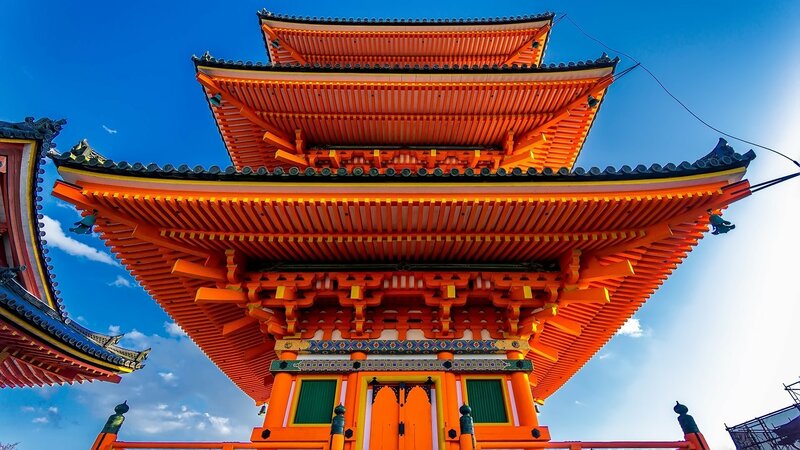 The Heian Shrine would be your next logical stop. This is a shrine that is hard to miss. It is very large, and has two very large bright red gates to subtly hint its presence. There’s no entry fee, and the grounds are quite large. Crowds here are generally sparse, and you can view the shrine in about 30 minutes, after which you’ll be ready to view your next shrine. Head south towards Chion In. This shrine was built in the 17th century. You’ll be greeted by a very large wooden gate, beyond which are three flights of very steep stone steps. I found running up the steps much easier than walking. At the top of the steps, the grounds open up to the rest of the shrine. It is definitely worth the climb. This shrine closes at 5:00pm sharp, and security will very politely usher you out. No entry fee is required here. 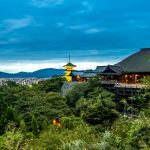 From Chion-In, catch a cab to the Kiyomizudera Temple. While you could walk here, Kiyomizudera is at the top of a hill, and after a day of walking, you are most likely not going to have a lot of energy to climb a hill. If you’ve timed this right, you should arrive at Kiyomizudera around 4pm. This temple is best viewed at sunset. There is a JPY500 entry fee for this temple. Kiyomizudera takes on very different appearances in spring and in fall. It looks over Kyoto and offers an iconic view of the city. The temple closes its gates at 6pm, and their staff will usher out visitors over their public address system. The viewpoints for this particular view are along a walking route, which is very popular among tourists wanting to get their selfies. You may need to exercise some patience to get your favoured spot. Once done here, it ought to be dusk. Take a gentle walk down the hill and visit the Yasaka shrine. The Yasaka Shrine is on the edge of Gion. It is a very large shrine which frequently hosts weddings. This shrine comes into its own after dark when all the lanterns on it are illuminated. On the streets leading up to the temple, vendors will fire up the their grills to barbecue a range of different foods. The grilled squid is particularly popular. This ought to bring you to the end of a day of visiting shrines in Kyoto. Walk across the street, and get some dinner in Gion before making your way back to your hotel. Once again, you’ll want to start early. 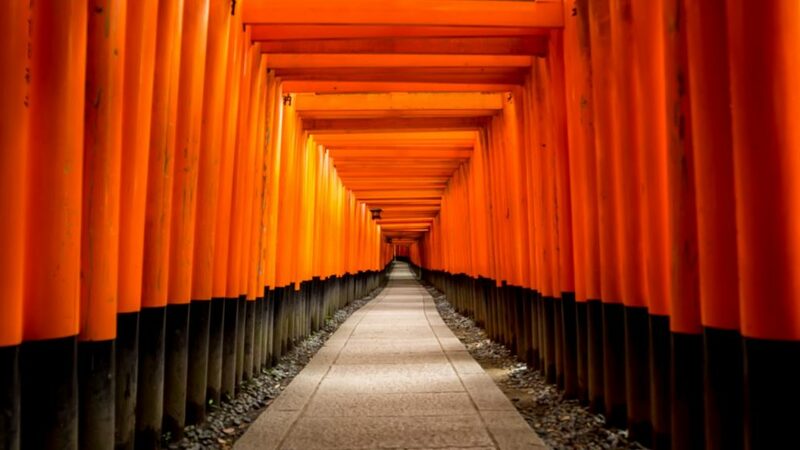 I recommend visiting the Fushimi Inari shrine first. This is a must-see shrine. While the shrine itself opens at 8:00am, the gates are open around the clock. The easiest way to get here from Kyoto is to take the Keihan Main line from Sanjo Station to Inari Station. The shrine is directly opposite the station. Get here early, preferably at the crack of dawn for the ultimate experience when the shrine is deserted and you will have it all to yourself. This shrine is home to the Senbon-Tori or ten-thousand red tori gates that form a tunnel. If you’ve watched “Memoirs of a Geisha”, you will recognise these gates and the path. The walk through these ten-thousand gates will take you on an ascent to the top of a mountain. This is best done at the crack of dawn when the air is cool. I cannot stress how important it is to come here early. 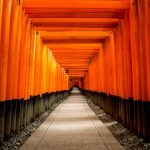 After 9:00am, hordes of tourists descend upon it, and the tori-gates become a tube which is a belly-to-back-shoulder-to-shoulder experience that is quite unpleasant. Once you’re in, you can only come out at the other end. The image above was shot at 5:30am. I had this environment to myself, with the occasional intrepid early-rising traveller crossing paths. Once done here, get a cab to get to the Kinkaku-ji temple. (Be sure you clearly articulate the “K”, or you’ll end up at Gingaku-ji). This is yet another must-see shrine that is very popular with tourists. The shrine opens at 8:30am. By 10:30am, The image above was shot at that time, and while it may appear peaceful and idyllic, there were a good 500 tourists present at the time. Having said that, the great thing about Japan is how organised they are. This behaviour rubs off on tourists who respect how the Japanese keep their nation so beautiful. This shrine has a JPY500 entry fee, which again, is totally worth it. A visit here will require about an hour. From here, catch a cab to Nijo Castle. This is a designated UNESCO World Heritage Site. This traditional castle is surrounded by a moat. Within its walls is a very elaborate Japanese Garden, and two concentric rings of fortification that protect the Ninomaru Palace inside. This is a classic example of social control manifested in architectural space. The palace is made entirely of timber and is intricately decorated with murals. The gardens too are very impressive and even more so in cherry blossom season. A visit here will require two hours, and while this does get busy, it is a large enough location to be able to find some quiet space. Once done here, take a cab or a train (from Nijo Castle station) back to Gion, and stroll through the streets. Gion is a district that has some very traditional Japanese architecture. If you’re lucky, you may spot a Maiko or a Geisha. They’re unmistakeable. Bear in mind that when they are out and about in full regalia, Geisha are working. While one may take a picture of them from a distance, one mustn’t harass them to pose for personal a tourist shot. At this stage, it will be around lunch time. 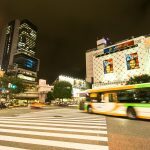 Gion offers a range of different places to eat – both traditional Japanese fare, or if you’re craving for a taste of home, a range of different international selections. After allowing yourself a decent amount of time for lunch, and to catch your breath, consider easing into the late afternoon and early evening by going for a walk along the canals in Kyoto. This is particularly enjoyable in cherry blossom season. My own personal account is somewhat quaint. I ventured out on a very rainy night with my camera and tripod. I was in a good mood, and while walking in the rain covered with a very large umbrella, I was whistling the tune of “Senbonzakura” – the one Japanese song that I know. A couple of young Japanese girls walked past me, heard me whistling and giggled as they walked past and looked at me. I saw them and smiled back, and we went on our own ways. Even though I was getting soaked in the rain, there was a certain feeling of being happy and at peace that I experienced. Fairly close to the canal are a range of places where one can find some excellent food. 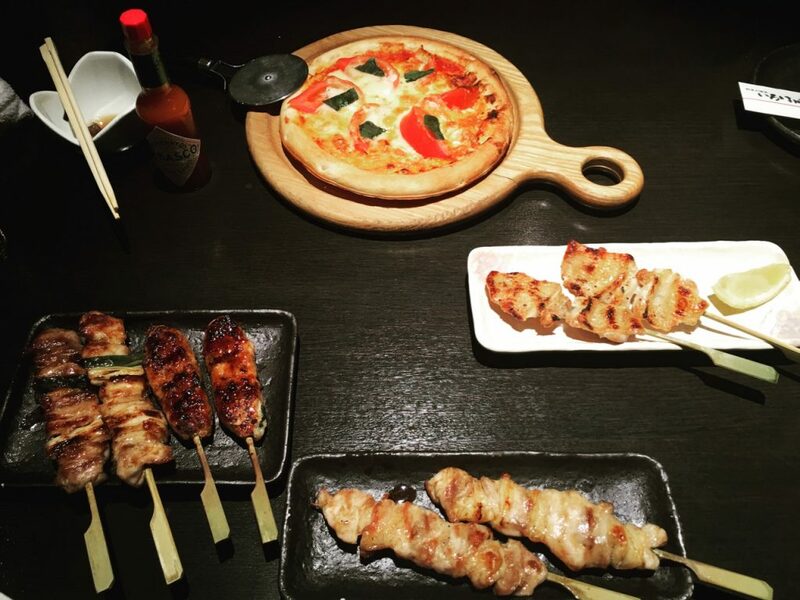 While somewhat spoiled for choice, we went the way of some Yakitori skewers and a pizza. (There is such a thing as Japanese Italian, and I recommend that you try it when in Japan). At the end of three days like this, you’d have experienced a lot of Kyoto, and would probably also feel tired. This is definitely a city that has a lot to see. At this stage, you’ll probably be ready to turn in to catch your train to either Osaka or Tokyo. There’s more to Kyoto than just shrines, castles and gardens. At Arashiyama, one can see monkeys. Kyoto has a decent sized art museum. It is also home to the International Manga Museum. I am told that Kyoto Station is worth seeing, and while I passed through to catch my train to Tokyo, I didn’t really have a chance to check the station out. Kyoto Tower is also a well known tourist attraction which I haven’t had the chance to experience. All shrines are not created equal. While in Kyoto, I had also visited some shrines that, while well maintained, are a bit out of the way and perhaps not as impressive as the ones that I have mentioned here. The Kamigano Jinja temple is one such temple that comes to mind. All that being said, you can’t really go wrong with Kyoto as a destination. Towel to dry yourself in case you get rained on. Appropriate outer gear. Consider the season at the time that you’re travelling. A small torch or flash light (for night-time shoots only). Water and some snacks (you will be probably get hungry and thirsty while walking around). 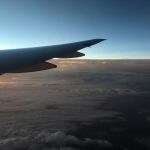 The accounts in this article are compiled from my own experiences from trips that I paid for myself. This post has not been sponsored – be it by any individual, commercial entity, or any other organisation. The opinions reflected herein are strictly my own. Receive the latest travel guides from the blog.